Find all the articles related to various festivals celebrated here in India. Whenever we think of Diwali or Deepavali, we are reminded of firecrackers, sweets, decorations with lights, Laxmi Puja, new clothes, holiday, celebrations, family gatherings and a feeling of excitement and warmth that comes from happiness all around us. The whole atmosphere during Diwali is of joy and celebration and rightly so. After all it is celebrated in honour of return of God Ram with his wife Sita and brother Laxman after defeating evil king Ravana. It symbolizes victory over evil, one which we hold so close to our hearts. If you think about it, all the things close to your heart are related to either your friends, family or that special someone. So this Diwali, why not do something for your loved ones? We have come up with a few gift ideas for Diwali this year. And being honest to the Diwali spirit these ideas will uphold the traditional values along with bringing a big smile on the faces of your sweetheart, friends, family and even social & business contacts. This is the simplest yet the most heart-warming gift for any occasion. And no, we are not talking about the e-greeting cards or even the corporate ones. Not even the ones at Archies. We are talking about the personalized, hand-made greeting cards. However simple they might be, they show the greatest care, love and of course personal touch. When everything around us is being done using technology, a personal hand-made card can achieve a much deserved appreciation. Get a paper, fold it in two, draw or paint something creative, write a message and voila, your greeting card is ready. It is the most traditional gift. If however you are looking to add a luxury touch to it we have developed a Silver Greeting Card which can be customized however you want. It cannot get more luxurious and personal than this! Contact us here for more details! Traditional Value: We think greeting cards show the traditional value of inner purity. It is a very old tradition to gift dry fruit boxes for Diwali. 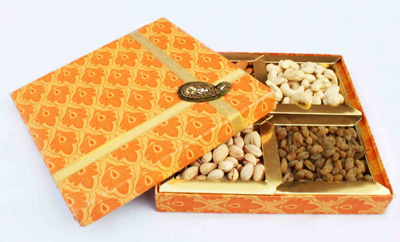 A lot of specially decorated boxes of Almonds, Cashews, Pistachios & Raisins are available in the market. Dry fruits are always accepted with smile. If however you are looking to add a touch of royalty and uniqueness to the traditional dry fruits do check our Silver Dry Fruits here. You’ll definitely receive appreciation and praise for this exotic gift idea. Traditional Value: We think Dry Fruits stand for the values of wisdom and prudence. The range for these starts at ₹50 and can be taken as high as desired. 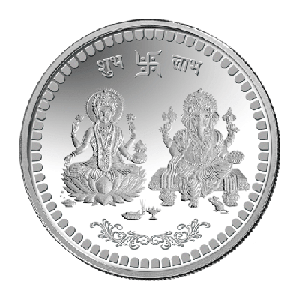 A wide variety of God Coins, Best Wishes Coins and Festive Coins are available practically every where. Coins are the easiest choice for many who are looking to gift something rich. But why go with the common coins? Gift something unique with Laser Engraved Coins or Lucky Coins. Both these options will show the recipient that you care enough for them and their well being. They will never forget this gesture of love. Traditional Value: Coins as a gift denote respect and personalized coins show how much you love and care. Chocolates can never go out of style or hearts and neither can the amazing varieties of Indian Mithai. These can be complementary as well as a whole gift in itself. The choices are huge. 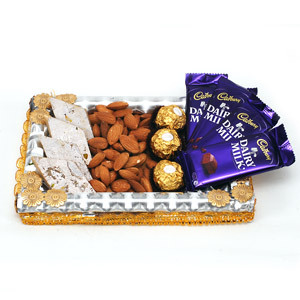 You can gift traditional sweets, imported chocolates, desi Cadbury and even western baked desserts. Make it into a basket, decorate it and it’s the most delicious gift ever. No one ever says no to chocolates & sweets and if they do, they sure aren’t happy about it. Thinking about how to add that luxury touch to this gift? Well, complement it with any of the wide range of Silver Gift Items available on our Shop and you have the most perfect gift for Deepavali. Traditional Value: We believe that this gift has a traditional value of being sweet (literally!) and kind hearted. Any gift given with a honest heart will definitely be appreciated. Be observant of the wishes of your loved ones because the best gift is the one most desired. 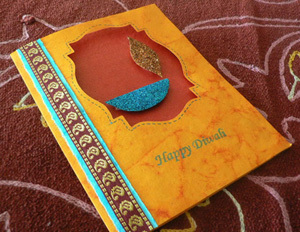 However, if you are still looking for a few more diwali gift ideas, do visit our shop page to see if you like anything.